A composite horn is actually a half-wave “coupler” horn with two or more half-wave, tuned horns attached to it. This technology was patented by Dukane in 1973. Because composite ultrasonic horn designs can often eliminate the need to invest in additional assembly systems, they reduce equipment costs and minimize production time for customers. Composite ultrasonic horn designs are common on applications that cover a large surface area and on applications where there are multiple insertion, staking, or welding points. Some of automotive customers use composite ultrasonic horns to attach insulator pads to door panels. Another common application that benefits from composite ultrasonic tooling is clamshell packaging (a vacuum-formed blister package). The composite horn saves manufacturers production time and costs, as it welds the package simultaneously at several different points, instead of using a multiple-head system or having an operator weld each point separately. Composite ultrasonic horns are also instrumental in applications where it’s difficult to create enough amplitude to weld. The amplitude at the face of a composite horn is higher than what could ever be achieved by a single large horn. The amplitude is designed into each of the individual half-wave horn attachments, not the coupler. A higher amplitude is generated at the weld area; this avoids causing excessive stress to the coupler horn. Although composite horns can eliminate the need for additional assembly systems, cut production times, and lower labor costs, they are more expensive than standard horns. The added cost is due to the extra metal and machining the composite horns require. Typical composite horns have aluminum couplers and titanium half-wave attachments. In addition to the expense of titanium, all of the half-wave attachments must be tuned within 50 cycles of each other. And they must be properly mounted onto the coupler horn. 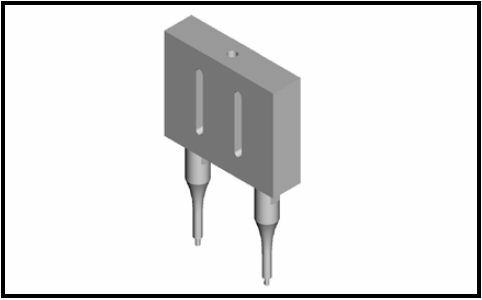 The most common mounting method utilizes a 1/2- or 3/8-inch threaded stud at the top of the half-wave attachment. It’s screwed into a threaded hole at the output face of the coupler. It’s also possible to use a “tuned bolt” to fasten the half-wave attachments. The bolt is mounted through the coupler. Then the horn attachments are bolted to the coupler. The “tuned bolt” method is primarily used on composite horns that have two or more blade horn attachments. In addition to the extra metal and machining that’s required, composite horns have more design considerations than a standard horn. We always have to make sure the horn we’re designing is balanced. But when we deal with composite horns, all of the horn attachments have to be positioned evenly around the coupler, so the weight is evenly distributed. Sometimes the attachments are different lengths and different shapes, but you still have to keep the horn balanced. Despite the added challenges in the design and manufacture of composite horns, they have provided consistent performance and productivity for Dukane customers. If an application can use a composite horn, the increase in productivity and the cost savings are so great that the initial added cost in tooling is more than justified. For more information on ultrasonic assembly and other horn designs, you can view our Guide To Ultrasonic Plastic Assembly.